Since arriving in October along with iOS 5, Siri has scarcely been out of the public eye, and while much of the coverage has shed Apple’s system-wide voice assistant in a positive light, it has also yielded its fair share of skeptics and critics. While opinion remains divided regarding a service which – we should remember – is still in public beta, developers from both sides of the jailbreaking fence have been keen to release similar apps to Siri, which is limited to the iPhone 4S only. Vokul is the latest in a long list of Siri-esque releases, and, much like its Apple-created counterpart, its video advertisement presents a smooth, seamless product. Considering Apple has come under fire (and litigation) for misrepresenting Siri in ads, I was intrigued to see if vokul would also wind up being something of a let-down. During the set-up tutorial, you get to pick from three different versions of English – US, UK, and AUS, and in order to become acquainted with vokul (pronounced "vocal"), you’re asked to say, "hey vokul" a couple of times. Picking up on an area Siri doesn’t cover, there are two ways of initiating vokul, and while you can "touch and talk" to activate it in a similar manner to Siri, you can also activate it by voice, by repeating the command "hey vokul" when in "always-on" mode. Once those two magic words are spoken, you can ask vokul to perform a variety of basic tasks such as send an SMS, e-mail or make a call to a specific contact, or update your statuses on Twitter or Facebook. It includes a useful "fitness mode", which doesn’t require the "hey vokul" pleasantries before a command since, presumably, you’ll be too bereft of breath to make small-talk with it. So, the features are there, but does it deliver the goods in terms of accuracy? Well, perhaps surprisingly – yes it does. 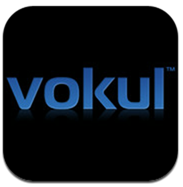 Having seen many Siri-like apps disappoint, I didn’t hold out much hope for vokul, but it seems a lot more advanced than rivaling apps, and didn’t have any problem processing most of my commands. It costs $2.99 over at the App Store, and is certainly worth the price tag. Ideal for those constantly in the car or a situation where hands-free is a necessity, the always-on feature capitalizes on a glaring oversight on Apple’s part. The very point of voice recognition is that the device doesn’t need to be physically touched, and not only does vokul deal with this issue, but it works on all iOS devices.